To Cite: Khazraee H, Omidi A, Daneshvar Kakhki R, Zanjani Z, Sehat M. Effectiveness of Acceptance and Commitment Therapy in Cognitive Emotion Regulation Strategies, Headache-Related Disability, and Headache Intensity in Patients with Chronic Daily Headache, Iran Red Crescent Med J. 2018 ; 20(S1):e57151. doi: 10.5812/ircmj.57151. Background: Chronic daily headache is a serious disease, causing significant problems such as disability. It is characterized by pain localized to the head (headache) and headaches occurring on 15 or more days per month for more than 3 months (> 180 days per year). Programs for pain and health improvement in patients with painful diseases, such as headache, are not still fully developed. Acceptance and commitment therapy (ACT) is a new psychotherapy, which appears to be effective in the treatment of chronic pain. Objectives: This study aimed to examine the effectiveness of ACT in cognitive emotion regulation strategies, headache-related disability, and headache intensity in patients with chronic daily headaches. Methods: In the current study, a semi-experimental method was applied. The study was conducted at Shahid Beheshti Governmental hospital of Kashan, Iran in 2016. The sample consisted of 40 patients with chronic daily headache, who were selected via convenience sampling. The participants were randomly allocated into medical treatment as usual (MTAU) and ACT groups (20 samples per group) via block randomization. The ACT group received eight 90-minute weekly treatments, based on the ACT protocol. 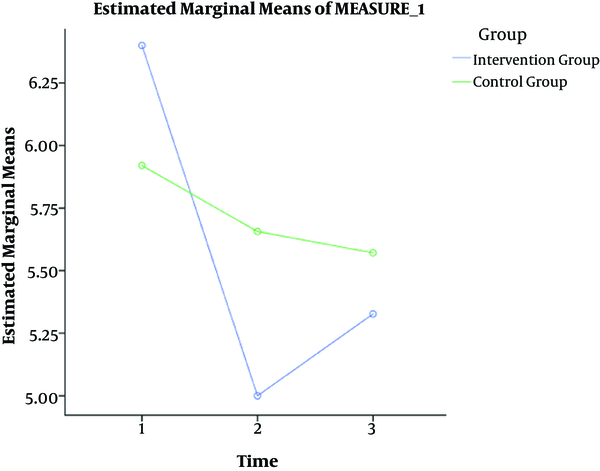 The cognitive emotion regulation questionnaire (CERQ), diary of headache severity, and headache-related disability inventory (HDI) were administered at pretreatment, posttreatment, and three-month follow-up in both groups. Results: In the current study, no significant differences were found between the groups in terms of demographic variables (P > 0.05). In the ACT group, the mean (SD) scores of emotional and functional aspects of headache disability were 26.87 ± 10.11 and 28.50 ± 9.04, respectively before the intervention, which decreased to 17.75 ± 8.32 and 18.12 ± 9.42 after the intervention and 21.37 ± 8.53 and 21.37 ± 9.87 in the follow-up, respectively (P < 0.05). In addition, the mean (SD) score of nonadjustment cognitive emotion regulation strategies was 54.31 ± 10.02 at pretreatment, which significantly reduced to 44.43 ± 7.7 at posttreatment and 49.78 ± 9.1 in the follow-up (P < 0.05). Furthermore, the mean (SD) score of adjustment cognitive emotion regulation strategies was 61.43± 12.02 in the pretest, which significantly increased to 72.06 ± 8.66 in the posttest and 69.62 ± 11.84 in the follow-up (P < 0.05). The mean score of headache intensity decreased from 6.40 ± 1.19 to 5.00 ± 1.09, compared to the pretest (P < 0.05); however, there was no significant difference between the groups in the follow-up (P > 0.05). Conclusions: The results of the present study suggested that ACT is an effective treatment for reducing nonadjustment cognitive emotion regulation strategies, headache-related disability, and headache intensity and improving adjustment emotion regulation strategies in patients with chronic daily headache. Chronic daily headache (CDH) refers to a group of headache disorders, occurring on ≥ 15 days per month for ≥ 3 months (1). CDH includes chronic migraine, chronic tension-type headache, new daily persistent headache, and hemicrania continua. The overall prevalence of CDH in the general adult population has been reported at 1% - 5% in previous studies (2). Patients with CDH are one of the most difficult groups to manage in neurological practice (3). CDH is recognized as a serious disease with significant adverse effects on most domains of human life, such as reduced quality of life related to physical and mental health, disability (4, 5), and decreased productivity (6). Overall, CDH-related disability can lead to severe and frequent headaches, comorbidities, and associated symptoms (7-10). Headache has three major dimensions: pain, disability, and affective distress (11). Among the contributing factors of headaches, psychological stress has been reported as the most significant factor (12). Stress can lead to an altered state of the brain, such as increased cortical excitability (13). Stressful life events are associated with the onset of CDH (14), which often occurs periodically (15). Numerous studies have linked pain to emotional dysregulation (16). It seems that attention and emotional reactions to pain play important roles in the persistence of pain (17) and result in more intense pain perceptions, disrupting the patient’s life (18). Emotional awareness deficits are also related to somatosensory amplification (increased attention to and concern about one’s body), which may prompt an increase in pain (19). Many patients with CDH fail to follow medical treatments and seek alternative therapies. On the other hand, successful treatment plans can change most aspects of a patient’s life (3). CDH should be managed with a multidisciplinary biopsychosocial approach, such as nonpharmacological, pharmacological, and complementary therapies (17). Psychological approaches have a long history of successful chronic pain treatment. One of the most common psychological interventions for chronic pain is cognitive-behavioral therapy, which has become the dominant psychological treatment for chronic pain (20, 21). However, it has some limitations (21), resulting in the development of new interventions. Various psychological interventions, including mindfulness and acceptance interventions, have been examined for their effects on pain (17, 22). Acceptance-based approaches suggest that pain and impairment may be decreased by acceptance rather than escape and avoidance behaviors (23, 24). In ACT, avoidance of distress and pain is conceptualized as a major problem, substantially contributing to disability (25). Avoidance of pain predicts disability and pain-related distress in patients with chronic pain (26-28). On the other hand, acceptance improves the patient’s tolerance of pain (29). ACT includes a combination of acceptance, mindfulness, and behavior-change methods (30). Mindfulness-based methods are effective in symptom reduction and improved emotional functioning for patients with chronic pain (31, 32). While other pain coping strategies attempt to reduce the symptoms, the aim of ACT is to maximize the individual’s potential for a rich, fulfilling, and meaningful life, without allowing pain to be a major factor in his/her life (5). Based on empirical evidence, ACT has gained increased attention and support, particularly in the treatment of chronic pain (33). In systematic reviews, ACT has been shown to be effective in the treatment of chronic pain (34). However, these reviews specifically excluded headache, and therefore, the potential effectiveness of ACT in CDH is still unclear. According to review studies, the high prevalence and incidence of CDH can lead to various disabling problems, such as psychological and emotional disorders, which can result in the relapse of headache symptoms and disability among patients. Considering the shortcomings of medical treatments for CDH, importance of psychological problems and stress, and possible causes of headache (emotional regulation problems, nonacceptance of pain, and disease-associated problems), it seems essential to use psychological interventions, alongside pharmacological treatments. It is assumed that psychological treatments, along with medical treatments, can reduce the risk of disability. Therefore, studying the effects of new psychological treatments, such as ACT, seems necessary in patients with CDH. In fact, ACT may provide a unified approach to the treatment of both headache-related disability and pain. This study aimed to examine the effectiveness of ACT in cognitive emotion regulation strategies, headache-related disability, and headache intensity among patients with chronic daily headache. The current semi-experimental study was conducted at Shahid Beheshti governmental hospital of Kashan, Iran in 2016. The research committee of Kashan University of Medical Sciences approved the study (ethical code, IR.KAUMS.MEDNT.REC.1396.53). The participants signed an informed consent form and were given information about the purpose of the study and their right to withdraw from the study. They were assured about the confidentiality of their personal information. The participants included adults with chronic daily headache/migraine, who were referred by expert neurologists to the neurology clinic of Shahid Beheshti hospital of Kashan, Iran. The inclusion criteria were as follows: 1, chronic daily headache according to the international classification of headache disorders (third edition, beta version) (35); 2, willingness to participate in the study; 3, age range of 18 - 60 years; 4, no medical diagnosis of organic brain or psychotic disorders; 5, no history of psychological treatments in the preceding six months; 6, lack of other chronic pain problems; and 7, no history of epileptic seizures or facial nerve pain. Forty patients were selected via purposive sampling and randomly assigned to ACT and medical treatment as usual (MTAU) groups through block randomization. The MTAU group was treated with antidepressants, beta-blockers, calcium-channel blockers, or anticonvulsants. The ACT group received ACT training in addition to MTAU. The ACT group was trained for eight weeks by an expert with a Master’s degree in clinical psychology under the supervision of a clinical psychologist with a PhD degree. The adopted Persian ACT protocol for chronic pain, based on the manual of Vowles and colleagues (37), was used in this intervention. The ACT comprised of eight 90-minute weekly group sessions in two months. The overall content of the sessions is presented in Table 1. 1 A, Review of treatment history; B, introduction of the possibility that change is possible, but perhaps not through symptom reduction. 2 A, Review of interactions between feelings, thoughts, and actions that lead to vicious cycles; (B) exercises to control thoughts and/or emotions; C, introduction of the idea that changes in action may mean changes that directly contribute to meaningful and successful living (i.e., values), not changes in stubborn avoidance behaviors; D, mindfulness practice. 3 A, Value-clarification exercises and emphasis on awareness and identification; B, practice of mindful breathing. 4 A, Continued value-clarification exercises; B, discussion about barriers and exercise of value-based actions, even in aversive situations; C, setting an effective goal related to values; D, body sensation awareness exercises. 5 A, Discussion about activity cycling and pacing; B, cognitive defusion exercises; C, awareness exercises. 6 A, Continued cognitive defusion exercises; B, “thought watching” exercise; C, continued discussion of openness to experience discomfort in the service of a meaningful life. 7 A, Awareness and exercises pertaining to the ways in which people add additional, often unnecessary, distress to already distressing situations; B, continued discussion about willingness towards a meaningful life; C, mindful walking exercise. 8 A, Preparation for relapses and setbacks. CERQ is a 36-item questionnaire, consisting of nonadjustment and adjustment emotion regulation strategies. All items are rated on a five-point Likert scale, ranging from one (almost never) to five (almost always) (39); a higher subscale score reflects the greater use of the strategy. Research on cognitive emotion regulation strategies has shown that all subscales have good internal consistencies (40). Cronbach’s alpha for internal consistency of the subscales ranges from 0.60 to 0.80 (41). A previous study regarding the reliability of adjustment and nonadjustment strategies reported Cronbach’s alpha coefficients of 0.91 and 0.87, respectively (39). In another study from Iran, the reliability of CERQ was measured using Cronbach’s alpha coefficient (0.82). Also, regarding the validity of the questionnaire, the correlation coefficients of nonadjustment emotion regulation strategies for depression and anxiety were 0.35 and 0.37, respectively in the general health questionnaire (42). HDI (43) is a 25-item scale for the perceived impact of headache on emotional and daily functioning, with three possible options (“No”, 0 score; “Sometimes”, 2 scores; “Yes”, 4 scores). HDI appears to have acceptable short-term (r, 0.93 - 0.95 for one week) and long-term (r, 0.76 - 0.83 for two months) stability (43, 44). In a study from Iran regarding the reliability of HDI, Cronbach’s alpha coefficients for emotional and functional aspects were 0.68 and 0.83, respectively. In terms of concurrent validity, the correlation coefficients of emotional and functional factors of HDI and symptom checklist (SCL-25) were 0.71, 0.51, and 0.55, respectively (45). This scale (38) was used as a measure of headache intensity. The patients were asked to record a diary of headache intensity on a rating scale from zero (absence of pain) to ten (most intense disabling headache). The mean headache intensity in one week was calculated by dividing the sum of severity scores by seven. The minimum score of headache severity is zero, while the maximum score is ten. The headache diary was presented to five patients, as well as a neurologist and a psychiatrist, to confirm its content validity (46). The reliability coefficient of the Persian version of the scale is estimated at 0.88 (46). The collected data were analyzed in SPSS version 24 (SPSS Inc., Chicago, IL, USA). Chi square test was used to compare the demographics in the groups (Table 2). Independent sample t test was used to identify the baseline differences between the intervention and control groups in terms of clinical characteristics. Also, Kolmogorov- Smirnov test was used to describe the normal distribution of variables, followed by parametric tests. Table 3 presents the mean and standard deviation (SD) of dependent variables. 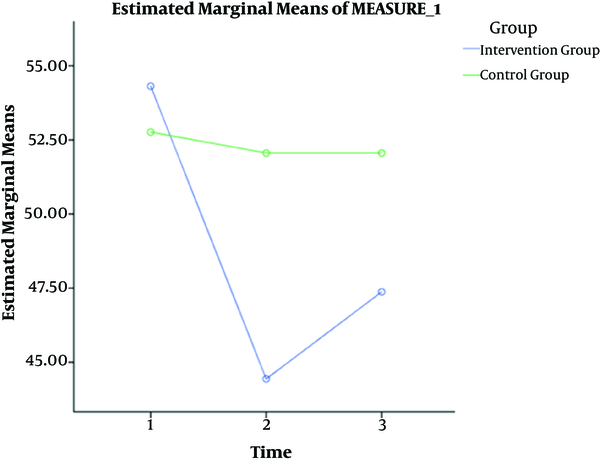 Analysis of variance (ANOVA) and repeated measures ANOVA were also performed to compare the groups regarding cognitive emotion regulation strategies, headache-related disability, and headache intensity at pretreatment, posttreatment, and three-month follow-up. P value less than 0.05 was considered significant in all tests. Abbreviations: ACT, Acceptance and Commitment Therapy; MTAU, Medical Treatment as Usual. Among 40 patients with CDH, who had been randomly assigned into ACT and control groups (20 patients per group), 33 (16 from the intervention group and 17 from the control group) completed the posttest and follow-up, and their data were included in the final analysis (Figure 1). Those who did not complete the intervention were excluded from the study. Table 2 demonstrates the demographic characteristics of the participants. There were no significant differences between the groups at baseline in terms of demographic variables. Independent t test also showed no significant differences between the groups at baseline regarding the clinical characteristics. 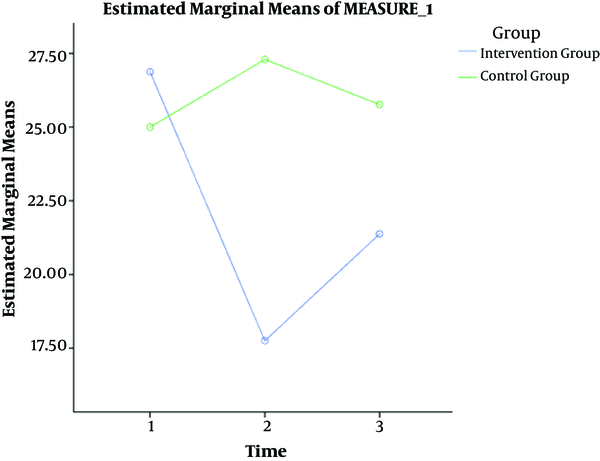 The results of Kolmogorov-Smirnov test revealed that variables of cognitive emotion regulation strategies, headache-related disability, and headache intensity were normally distributed in the intervention and control groups (P > 0.05). Table 3 shows the participants’ mean scores of dependent variables in the pretest, posttest, and follow-up. According to Table 3, there was more reduction in non-adjustment emotion regulation strategies and emotional and functional aspects of headache-related disability in the ACT group in comparison with the MTAU group from the pretest to posttest and follow-up; in fact, no reduction was observed in the MTAU group. On the other hand, adjustment emotion regulation strategies in the ACT group showed a significant increase in comparison with the MTAU group. The results revealed the significant effects of time and interaction between time and type of treatment on changes of scores. 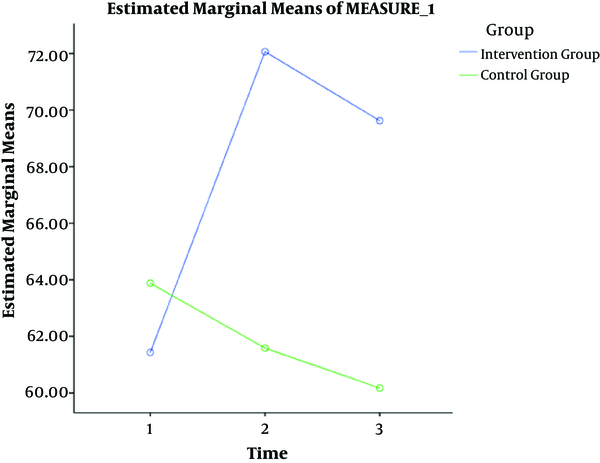 The within-subject test of repeated measures analysis indicated a significant time × group effect; in other words, emotion regulation strategies and all aspects of headache-related disability changed over time in the intervention group. The ANOVA test indicated a significant difference between the groups regarding headache intensity from pretest to posttest; however, there was no significant difference from pretest to follow-up. Figures 2 - 6 present the mean scores of adjustment and nonadjustment emotion regulation strategies, emotional and functional aspects of headache-related disability, and headache intensity in the ACT and MTAU groups at pretest, posttest, and follow-up. As shown in the graph, the groups, indicated by lines, change over time. This study compared the efficacy of ACT and MTAU in improving headache intensity, headache-related disability, and cognitive emotion regulation strategies among patients with chronic daily headache. This approach should be examined in the treatment of chronic daily headache, which is one of the most common complaints of the population. The results from highly disabled patients showed significant changes in the variables after treatment and follow-up, including improvements in nonadjustment and adjustment emotion regulation strategies and emotional and functional aspects of headache disability, compared to usual care after intervention. In addition, the ACT group showed a significant decrease in headache intensity after treatment, compared to the control group. Headache intensity in the ACT group decreased from pretest to follow-up, although the difference was not significant. These findings are similar to previous studies on acceptance-based interventions for management of chronic pain (27, 47-51). The present study showed that ACT might be an effective treatment for chronic daily headache. The effectiveness of ACT can be explained by processes of this treatment. One of the most important treatment techniques is mindfulness. The impact of mindfulness on patients with chronic pain has been revealed in several studies (47, 52, 53). Manipulation of attention in mindfulness techniques may influence the affective and sensory aspects of pain perception. Also, this technique increases body awareness and parasympathetic activity, leading to improved body mechanisms and reduction of pain. Finally, mindfulness strengthens emotion regulation skills, thereby decreasing stress and mood dysfunction (54, 55). Other processes in ACT include determination of values and committed action. In ACT, the primary goal is to alter responses to pain in order to reduce disability (56) and help patients with headache engage in value-directed behaviors and create a rich, fulfilling, and meaningful life while tackling with continuous headaches, particularly when efforts to decrease or control pain fail (57). Also, ACT emphasizes on the necessity of pain acceptance (openness to experience pain), response to pain-related experiences without unnecessary and unhelpful struggles for pain control or avoidance, and participation in activities regardless of painful experiences in order to improve function (27, 58). The goal of acceptance is to change the patient’s attitude towards the symptoms rather than to change the frequency of symptoms. Based on the present study, ACT is recommended as an effective psychotherapy for improving emotion regulation, headache-related disability, and headache intensity in patients with chronic daily headaches. The results also support the potential application of ACT model for chronic headaches. ACT can be combined with other medical treatments, which are known to be helpful in this population. This approach provides a promising framework for further therapy development and challenges researchers to reconsider the experience of pain. Several limitations of this investigation need to be explained. One of the main limitations was lack of the necessary facilities to conduct the study in all governmental or private centers. Another limitation was the gender of the study sample. The majority of the participants were female, which limits the interpretation of results for males. Therefore, future investigations should attempt to replicate and extend these results and their generalizability to other settings, headache patient groups, and genders. The strength of the present study was investigation of the effects of a new psychological treatment for patients with chronic daily headache. ACT is a unique empirical and psychological intervention, which uses acceptance and mindfulness strategies, together with commitment and behavior-change strategies. Conflict of Interests: None of the authors declare any conflicts of interest. 1. Dodick DW. Clinical practice. Chronic daily headache. N Engl J Med. 2006;354(2):158-65. doi: 10.1056/NEJMcp042897. [PubMed: 16407511]. 2. Pascual J, Colas R, Castillo J. Epidemiology of chronic daily headache. Curr Pain Headache Rep. 2001;5(6):529-36. doi: 10.1007/s11916-001-0070-6. [PubMed: 11676887]. 3. Halker RB, Hastriter EV, Dodick DW. Chronic daily headache: an evidence-based and systematic approach to a challenging problem. Neurology. 2011;76(7 Suppl 2):S37-43. doi: 10.1212/WNL.0b013e31820d5f32. [PubMed: 21321350]. 4. Seshia SS, Wang SJ, Abu-Arafeh I, Hershey AD, Guidetti V, Winner P, et al. Chronic daily headache in children and adolescents: a multi-faceted syndrome. Can J Neurol Sci. 2010;37(6):769-78. doi: 10.1017/S0317167100051428. [PubMed: 21059537]. 5. Chiappedi M, Mensi MM, Termine C, Balottin U. Psychological Therapy in Adolescents with Chronic Daily Headache. Curr Pain Headache Rep. 2016;20(1):3. doi: 10.1007/s11916-015-0532-x. [PubMed: 26695063]. 6. Meletiche DM, Lofland JH, Young WB. Quality-of-life differences between patients with episodic and transformed migraine. Headache. 2001;41(6):573-8. doi: 10.1046/j.1526-4610.2001.041006573.x. [PubMed: 11437893]. 7. Leonardi M, Raggi A. Burden of migraine: international perspectives. Neurol Sci. 2013;34 Suppl 1:S117-8. doi: 10.1007/s10072-013-1387-8. [PubMed: 23695058]. 8. Katsarava Z, Buse DC, Manack AN, Lipton RB. Defining the differences between episodic migraine and chronic migraine. Curr Pain Headache Rep. 2012;16(1):86-92. doi: 10.1007/s11916-011-0233-z. [PubMed: 22083262]. 9. Steiner TJ, Stovner LJ, Birbeck GL. Migraine: the seventh disabler. Headache. 2013;53(2):227-9. doi: 10.1111/head.12034. [PubMed: 23317094]. 10. Lanteri-Minet M, Duru G, Mudge M, Cottrell S. Quality of life impairment, disability and economic burden associated with chronic daily headache, focusing on chronic migraine with or without medication overuse: a systematic review. Cephalalgia. 2011;31(7):837-50. doi: 10.1177/0333102411398400. [PubMed: 21464078]. 11. Broadbent E, Niederhoffer K, Hague T, Corter A, Reynolds L. Headache sufferers' drawings reflect distress, disability and illness perceptions. J Psychosom Res. 2009;66(5):465-70. doi: 10.1016/j.jpsychores.2008.09.006. [PubMed: 19379963]. 12. Kolotylo CJ, Broome ME. 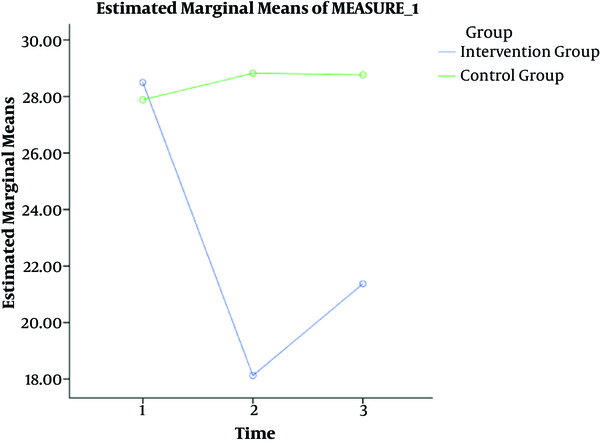 Predicting disability and quality of life in a community-based sample of women with migraine headache. Pain Manag Nurs. 2000;1(4):139-51. doi: 10.1053/jpmn.2000.19344. [PubMed: 11709867]. 13. Chen WT, Wang SJ, Fuh JL, Lin CP, Ko YC, Lin YY. Persistent ictal-like visual cortical excitability in chronic migraine. Pain. 2011;152(2):254-8. doi: 10.1016/j.pain.2010.08.047. [PubMed: 21145169]. 14. Scher AI, Lipton RB, Stewart W. Risk factors for chronic daily headache. Curr Pain Headache Rep. 2002;6(6):486-91. doi: 10.1007/s11916-002-0068-8. [PubMed: 12413408]. 15. Maleki N, Becerra L, Borsook D. Migraine: maladaptive brain responses to stress. Headache. 2012;52 Suppl 2:102-6. doi: 10.1111/j.1526-4610.2012.02241.x. [PubMed: 23030541]. 16. Hamilton NA, Karoly P, Kitzman H. Self-regulation and chronic pain:The role of emotion. Cognit Ther Res. 2004;28(5):559-76. doi: 10.1023/b:cotr.0000045565.88145.76. 17. Seshia SS. Chronic daily headache in children and adolescents. Curr Pain Headache Rep. 2012;16(1):60-72. doi: 10.1007/s11916-011-0228-9. [PubMed: 22102156]. 18. Bener A, Verjee M, Dafeeah EE, Falah O, Al-Juhaishi T, Schlogl J, et al. Psychological factors: anxiety, depression, and somatization symptoms in low back pain patients. J Pain Res. 2013;6:95-101. doi: 10.2147/JPR.S40740. [PubMed: 23403693]. 19. Lumley MA, Cohen JL, Borszcz GS, Cano A, Radcliffe AM, Porter LS, et al. Pain and emotion: a biopsychosocial review of recent research. J Clin Psychol. 2011;67(9):942-68. doi: 10.1002/jclp.20816. [PubMed: 21647882]. 20. White CA. Cognitive behaviour therapy for chronic medical problems: A guide to assessment and treatment in practice. John Wiley & Sons Ltd; 2001. 21. Hayes SC, Follette VM, Linehan M. Mindfulness and acceptance: Expanding the cognitive-behavioral tradition. Guilford Press; 2004. 22. 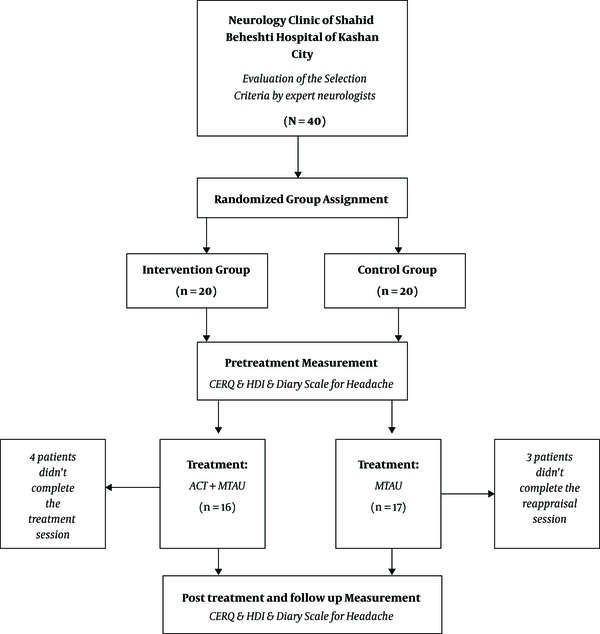 Momeni J, Omidi A, Raygan F, Akbari H. The effects of mindfulness-based stress reduction on cardiac patients' blood pressure, perceived stress, and anger: a single-blind randomized controlled trial. J Am Soc Hypertens. 2016;10(10):763-71. doi: 10.1016/j.jash.2016.07.007. [PubMed: 27632925]. 23. Hayes SC, Bissett RT, Korn Z, Zettle RD, Rosenfarb IS, Cooper LD, et al. The impact of acceptance versus control rationales on pain tolerance. Psychol Rec. 2017;49(1):33-47. doi: 10.1007/bf03395305. 24. McCracken LM, Eccleston C. Coping or acceptance: what to do about chronic pain? Pain. 2003;105(1-2):197-204. doi: 10.1016/S0304-3959(03)00202-1. [PubMed: 14499436]. 25. Hayes SC, Luoma JB, Bond FW, Masuda A, Lillis J. Acceptance and commitment therapy: model, processes and outcomes. Behav Res Ther. 2006;44(1):1-25. doi: 10.1016/j.brat.2005.06.006. [PubMed: 16300724]. 26. McCracken LM, Vowles KE. A prospective analysis of acceptance of pain and values-based action in patients with chronic pain. Health Psychol. 2008;27(2):215-20. doi: 10.1037/0278-6133.27.2.215. [PubMed: 18377140]. 27. Omidi A, Zanjani Z, FadaviKashani MH, DaneshvarKakhaki R. The evaluation of the construct and convergent validity and reliability of Psychological Inflexibility in Pain Scale (PIPS) in individuals with migraine headache. Iran J Psychiatry Behav Sci. Forthcoming. 28. McCracken LM, Eccleston C. A prospective study of acceptance of pain and patient functioning with chronic pain. Pain. 2005;118(1-2):164-9. doi: 10.1016/j.pain.2005.08.015. [PubMed: 16203093]. 29. Kohl A, Rief W, Glombiewski JA. How effective are acceptance strategies? A meta-analytic review of experimental results. J Behav Ther Exp Psychiatry. 2012;43(4):988-1001. doi: 10.1016/j.jbtep.2012.03.004. [PubMed: 22561050]. 30. Hayes SC, Strosahl KD, Wilson KG. Acceptance and commitment therapy: An experiential approach to behavior change. Guilford Press; 1999. 31. Baer RA. Mindfulness training as a clinical intervention: A conceptual and empirical review. Clin Psychol Sci Pract. 2006;10(2):125-43. doi: 10.1093/clipsy.bpg015. 32. Grossman P, Niemann L, Schmidt S, Walach H. Mindfulness-based stress reduction and health benefits. A meta-analysis. J Psychosom Res. 2004;57(1):35-43. doi: 10.1016/S0022-3999(03)00573-7. [PubMed: 15256293]. 33. Wicksell RK, Vowles KE. The role and function of acceptance and commitment therapy and behavioral flexibility in pain management. Pain Manag. 2015;5(5):319-22. doi: 10.2217/PMT.15.32. [PubMed: 26238018]. 34. Veehof MM, Trompetter HR, Bohlmeijer ET, Schreurs KM. Acceptance- and mindfulness-based interventions for the treatment of chronic pain: a meta-analytic review. Cogn Behav Ther. 2016;45(1):5-31. doi: 10.1080/16506073.2015.1098724. [PubMed: 26818413]. 35. Headache Classification Committee of the International Headache S. The International Classification of Headache Disorders, 3rd edition (beta version). Cephalalgia. 2013;33(9):629-808. doi: 10.1177/0333102413485658. [PubMed: 23771276]. 36. Gharaei-Ardakani S, Azad Fallah P , Tavallaei S. A . The effectiveness of acceptance and commitment therapy on pain experience in women with chronic pain. J Clin Psychol. 2012;4(2):39-50. Persian. 37. Vowles KE, Wetherell JL, Sorrell JT. Targeting acceptance, mindfulness, and values-based action in chronic pain: Findings of two preliminary trials of an outpatient group-based intervention. Cogn Behav Pract. 2009;16(1):49-58. doi: 10.1016/j.cbpra.2008.08.001. 38. Olesen J. New international headache classification. Neuroepidemiology. 1989;8(2):53-5. doi: 10.1159/000110166. [PubMed: 2922098]. 39. Garnefski N, Kraaij V, Spinhoven P. Negative life events, cognitive emotion regulation and emotional problems. Pers Individ Dif. 2001;30(8):1311-27. doi: 10.1016/s0191-8869(00)00113-6. 40. Garnefski N, Kraaij V, Spinhoven P. Manual for the use of the cognitive emotion regulation questionnaire. Leiderdorp, The Netherlands: DATEC; 2002. 41. Garnefski N, Koopman H, Kraaij V, ten Cate R. Brief report: Cognitive emotion regulation strategies and psychological adjustment in adolescents with a chronic disease. J Adolesc. 2009;32(2):449-54. doi: 10.1016/j.adolescence.2008.01.003. [PubMed: 18775562]. 42. Salehi A, Baghaban I, Bahrami F, Ahmadi S. Relationships between cognitive emotion regulations strategies and emotional problems with regard to personal and familial factors. J Fam Couns Psychother. 2011;1(1):1-18. Persian. 43. Jacobson GP, Ramadan NM, Aggarwal SK, Newman CW. The Henry Ford Hospital Headache Disability Inventory (HDI). Neurology. 1994;44(5):837-42. doi: 10.1212/WNL.44.5.837. [PubMed: 8190284]. 44. Jacobson GP, Ramadan NM, Norris L, Newman CW. Headache disability inventory (HDI): short-term test-retest reliability and spouse perceptions. Headache. 1995;35(9):534-9. doi: 10.1111/j.1526-4610.1995.hed3509534.x. [PubMed: 8530277]. 45. Sajadinezhad M, Mohammadi N, Ashjazadeh N. The evaluation of psychometric properties of headache disability inventory in the headache patients. J Shahrekord Univ Med Sci. 2007;9(1):55-62. Persian. 46. Sadoughi M, Akkashe G. Effectiveness of cognitive-behavioral therapy on reduction of chronic tension headache. J Shahrekord Univ Med Sci. 2009;11(3):85-92. Persian. 47. McCracken LM, MacKichan F, Eccleston C. Contextual cognitive-behavioral therapy for severely disabled chronic pain sufferers: effectiveness and clinically significant change. Eur J Pain. 2007;11(3):314-22. doi: 10.1016/j.ejpain.2006.05.004. [PubMed: 16762571]. 48. Kranz D, Bollinger A, Nilges P. Chronic pain acceptance and affective well-being: a coping perspective. Eur J Pain. 2010;14(10):1021-5. doi: 10.1016/j.ejpain.2010.03.010. [PubMed: 20427215]. 49. McCracken LM, Zhao-O'Brien J. General psychological acceptance and chronic pain: there is more to accept than the pain itself. Eur J Pain. 2010;14(2):170-5. doi: 10.1016/j.ejpain.2009.03.004. [PubMed: 19349199]. 50. Vowles KE, McCracken LM, O'Brien JZ. Acceptance and values-based action in chronic pain: a three-year follow-up analysis of treatment effectiveness and process. Behav Res Ther. 2011;49(11):748-55. doi: 10.1016/j.brat.2011.08.002. [PubMed: 21885034]. 51. Dahl JA, Wilson KG, Nilsson A. Acceptance and commitment therapy and the treatment of persons at risk for long-term disability resulting from stress and pain symptoms: A preliminary randomized trial. Behav Ther. 2004;35(4):785-801. doi: 10.1016/s0005-7894(04)80020-0. 52. Cho S, Heiby EM, McCracken LM, Lee SM, Moon DE. Pain-related anxiety as a mediator of the effects of mindfulness on physical and psychosocial functioning in chronic pain patients in Korea. J Pain. 2010;11(8):789-97. doi: 10.1016/j.jpain.2009.12.006. [PubMed: 20338821]. 53. Schutze R, Rees C, Preece M, Schutze M. Low mindfulness predicts pain catastrophizing in a fear-avoidance model of chronic pain. Pain. 2010;148(1):120-7. doi: 10.1016/j.pain.2009.10.030. [PubMed: 19944534]. 54. Zeidan F, Martucci KT, Kraft RA, Gordon NS, McHaffie JG, Coghill RC. Brain mechanisms supporting the modulation of pain by mindfulness meditation. J Neurosci. 2011;31(14):5540-8. doi: 10.1523/JNEUROSCI.5791-10.2011. [PubMed: 21471390]. 55. Zeidan F, Grant JA, Brown CA, McHaffie JG, Coghill RC. Mindfulness meditation-related pain relief: evidence for unique brain mechanisms in the regulation of pain. Neurosci Lett. 2012;520(2):165-73. doi: 10.1016/j.neulet.2012.03.082. [PubMed: 22487846]. 56. Vowles KE, Fink BC, Cohen LL. Acceptance and Commitment Therapy for chronic pain: A diary study of treatment process in relation to reliable change in disability. J Contextual Behav Sci. 2014;3(2):74-80. doi: 10.1016/j.jcbs.2014.04.003. [PubMed: 27818931]. 57. Vowles KE, Thompson M. Acceptance and Commitment Therapy for chronicpain. Mindfulness and acceptance in behavioral medicine: Current theory and practice. 2011. 58. McCracken LM, Carson JW, Eccleston C, Keefe FJ. Acceptance and change in the context of chronic pain. Pain. 2004;109(1-2):4-7. doi: 10.1016/j.pain.2004.02.006. [PubMed: 15082120].